A new report out today examines internal and external stresses from budget cuts and economic contractions on the states’ 30 largest school districts. When handled singly, districts have been able to cope with larger classes and even a shorter school year. But combinations of shocks to the system are stretching schools’ ability to serve children who are also facing financial strains at home. The 30 districts comprise 2 million students, about a third of the state, and range from Los Angeles Unified (667,000) and San Diego (132,000) to Twin Rivers and Chino Valley (32,000 each). Childhood poverty: Rates of childhood poverty increased since 2007 in 26 of the 30 largest districts. Poverty rates, as defined by federal guidelines, approached 50 percent in districts hardest hit by the recession: Fresno (49 percent) and Stockton (46 percent). In San Bernardino City Unified, the childhood poverty rate rose 60 percent, to 43 percent from 2007-2008. Rising poverty, accompanied by increases in students qualifying for subsidized meals at school, can signal malnutrition and turbulence at home, affecting children’s ability to concentrate. Just when they need more services and adults to help children cope, school districts have fewer resources. “Teachers will tell you that the needs that our students manifest when they don’t know if food is coming or know if they have a place to live in tomorrow are emotionally destabilizing. It is incredibly difficult for teachers dealing with that day in and day out,” says Fresno Unified Superintendent Michael Hanson. Fewer summer programs: Most districts have cut back their summer programs drastically since the recession, compounding problems for students struggling to advance to the next grade or considering dropping out. Enrichment summer programs have all but disappeared. This year, Los Angeles Unified will restrict summer offerings to a handful of high schools. The exceptions among districts are Oakland, Fresno, and Santa Ana, which have cut elsewhere or creatively used other sources of money to expand summer programs. Fewer instructional days: Twelve of the 30 districts have fewer than 180 instructional days, the norm until a few years ago. While three districts – Fontana, Long Beach, and San Jose – restored the week they had lost, three more – San Bernardino City, Moreno Valley, and Chino Valley – joined another half-dozen districts at 175 days. The report cited a Maryland study that found the passage rate in reading and math on a state test fell a half-percent for every unscheduled day off. 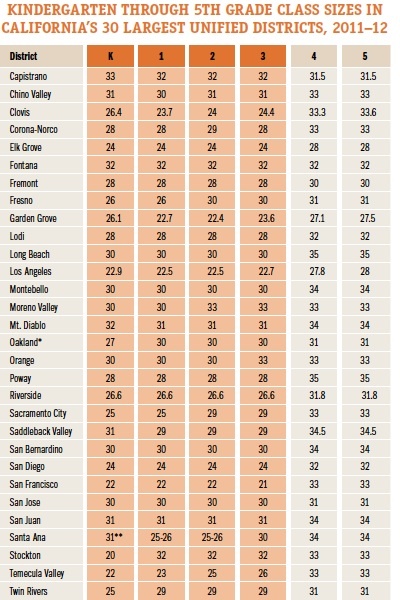 Larger classes: Of the 30 districts, only Stockton has an average class size of 20 or fewer, and only in kindergarten. 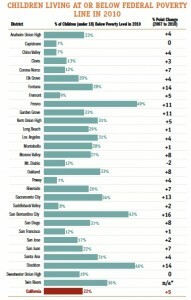 Half of the districts now report more than 30 students per class in one or more elementary grades, while two (San Francisco and Los Angeles) have kept K-3 below 23. The Legislature began to relax the state’s class-size reduction rules three years ago; Gov. Jerry Brown is proposing to remove all limits (subject to local bargaining) next year. Studies looking at the relation of class size to academic performance have been mixed, but any teacher will say that classes of 30 (or more in high school) limit individual attention and increase incidents of disruption. Fewer counselors: Students struggling with issues at home, whether joblessness, homelessness, or hunger, will bring their problems to school, which in the past has provided shelter from the storm. California already had the nation’s highest rate of counselors to students (1,810 to 1, 50 percent higher than the national average as of two years ago). There are on average 20 percent fewer counselors in 22 of 30 districts than pre-recession. High school students needing college advice are often on their own. Teacher layoffs: Only a fraction of teachers who receive layoff notices in March lose their jobs by summer, but it has been a significant fraction. Of 96,000 teachers in the 30 districts in 2010-11, nearly 11,000 received notices; of those, 20 percent or 2,213 were laid off last year. This year, with uncertainty over the November tax initiative looming, Los Angeles alone issued 9,507 layoff notices in March and San Diego 1,655. What cannot be quantified is the impact on teacher and school morale of massive notices. But the uncertainty is distracting and dispiriting, with teachers focusing much of their attention on job searches. English language learners currently get about 8 percent per student in extra funding, says the Legislative Analyst’s Office. That amount would more than quadruple in six years, to 37 percent, if the Legislature adopts Gov. Brown’s weighted student formula, phasing in substantially more money for every poor student and each English learner. That potential bonanza has advocates for English learners ecstatic and anxious. They see it as a long-overdue opportunity to help struggling students. But many also agree that without better ways to measure English learners’ progress and to make sure districts actually spend the money on English learners, there will be incentives to label too many children as English learners and then to keep them in that status for too long – doing more harm than good. There appears to be a consensus that some English learners are already stuck in the system, although there’s disagreement as to why. Nearly one in four students in the state are English learners, with 70 percent in elementary school. In some districts, like Santa Ana, more than 80 percent of English learners were born in the United States. If parents, filling out a four-question survey, responded that they most often speak to their children in a language other than English, their children were required to take the California English Language Development Test, or CELDT, often as kindergartners. In a study issued last year, the Center for Latino Policy Research at UC Berkeley concluded that CELDT is prone to misidentification, with only 6 percent of kindergarten students taking it in 2009-10 being classified as English language proficient. Since CELDT has never been administered to English-only kindergartners for comparison, it’s hard to know if the test is an accurate language measure or is a proxy for poverty and other deficits at home. The language survey is not able to distinguish students who are truly bilingual, says Associate Professor Lisa Garcia Bedolla, co-chairwoman of the Center for Latino Policy Research. But once identified as an English learner, a student is likely to stay an EL for years; an average of only 11 percent are redesignated annually as fluent in English and no longer needing extra help, which can include pulling a child from regular class for extra English support. Robert Linquanti, project director for English Learner Evaluation and Accountability Support and senior researcher for the California Comprehensive Center at WestEd, said that a reasonable target for reclassification should be about 20 percent each year, or one in five. The state auditor a few years back concluded that there were financial incentives for retaining students as English learners, but Linquanti said that districts with low reclassification rates tend to have poor procedures for monitoring, and administrators don’t make reclassification a priority. State Sen. Alex Padilla agrees. “There’s no smoking gun memorandum” that he’s seen discouraging teachers to reclassify English learners as proficient. The problem, he says, is that every district has its own redesignation criteria; they’re all over the map. That’s why Padilla, a Democrat from Los Angeles, is sponsoring two bills dealing with English learners, both of which passed the Senate Education Committee last week. SB 1109 is a broad bill; it would establish a master plan for English learners, looking at issues of initial classification, best practices and techniques for instruction, parent involvement, and the long-term learning needs of English learners. SB 1108 deals with redesignation specifically. It would require districts and county offices to report the redesignation criteria they use to the state Department of Education, which would analyze them and report back to the Legislature which methods are the most effective for determining fluency in English. “There needs to be uniformity and consistency,” Padilla said in an interview. The Legislature would determine whether the criteria would be mandatory for local districts after it sees the results, he said. The State Board of Education guidelines recommend using a combination of factors for determining redesignation: English proficiency scores on CELDT; scores on the California Standardized Tests, which students take in English; grades; teacher evaluations; and parental views. Students are considered proficient in English if they score early advanced or advanced on CELDT, but only 38 percent of students who test that high are actually redesignated. Districts come up with their own weights and throw in grades in science and math and district benchmark tests. Some teachers, it’s been said, consider absenteeism and other subjective factors. Financial incentives can cut both ways, said Chuck Weis, Santa Clara County superintendent, in testifying at the hearing, organized by Padilla, on a weighted student formula and English learners. Middle schools and high schools tend to push English learners through the pipeline too soon, he said, because they don’t have enough bilingual teachers, and the amount of state aid isn’t enough to cover needs of English learners in upper grades. Assemblymember Chris Norby, a Republican from Northern Orange County, sides with those who believe too many children are classified as English learners (he cites his own daughter as one) and then become “stuck in English language learning and cannot get out.” His bill, AB 1767, would consider scoring proficient or advanced on California Standardized Tests and a B average “prima facie evidence” for redesignation. Those students – only a few thousand per year by one estimate – clearly have academic fluency to succeed in regular English classes, he said. Norby’s bill so far has failed to get out of the Assembly Education Committee, but it includes an idea that Linquanti and other experts in English learners like: It would extend funding for English learners two years after they were reclassified as fully English proficient. This is critical, advocates say, because redesignation is a minimal standard; it doesn’t prepare students for rigorous academic English found in middle and high school courses. The money could also be used for monitoring students’ progress after redesignation– something that’s not done now. Gov. Schwarzenegger’s Committee on Education Excellence anticipated possible perverse incentives with extra funding for English learners. The committee suggested gradually cutting back funding over time, and then eliminating it for an English learner after seven or so years. Some of the concern about the disincentive to redesignate may be overstated, because the Department of Finance estimates that 74 percent of English learners also come from low-income households. Even if these students are redesignated as fully English proficient, without extra funding, they would receive an extra 37 percent for poverty – same dollars, different label. Brown is proposing to fund the weighted student formula by ending nearly all categorical programs, the specially protected programs for restricted purposes. Districts would have near total flexibility to spend money as they see fit. The governor is calling for full flexibility immediately, with weighted student funding phased in over six years. That worries advocates for English learners, because Economic Impact Aid, the biggest source of state aid for English learners, would be one of the eliminated categoricals. Thus, there’d be no guarantee that districts would continue to spend the extra money on English learners – now or when the weighted formula is ratcheted up. The debate over funding and classification coincides with other major changes. By summer’s end, the State Department of Education will finish recommendations for a new set of standards for English learners that aligns with the Common Core standards. New standards, in turn, will require a new assessment to replace CELDT. California must decide whether to join with other states in creating the test or go it alone. These are a lot of moving parts, not all of them in sync. All the more important, Padilla argues, to create a master plan for dealing with changes and to include uniform standards for tracking English learners’ progress. 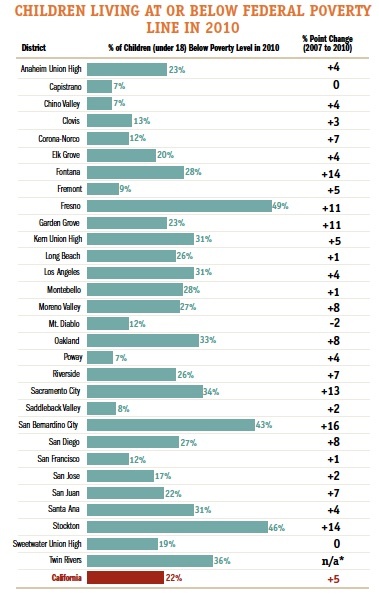 Districts in which nearly 90 percent of students are either low-income or English learners (such as Long Beach Unified and Los Angeles Unified) will get $3,000 more per student than districts where only 20 percent of students are disadvantaged (like Poway and Irvine) – once the new system of school funding that Gov. Jerry Brown is proposing is fully phased in. A district with 90 percent disadvantaged students would get $9,596 per student, compared with $6,444 for a district with only a 20 percent combination of English learners and low-income children. The formula assumes base funding of $6,000. Brown’s weighted pupil funding system would be a radical departure from the current system, in which districts’ revenues differ sharply and often irrationally, based on allocations of dozens of specially designated “categorical” programs, often using unfair or outdated formulas. Brown would end all but a handful of categoricals – special education funding the biggest exception – and reallocate the money based on districts’ concentrations of the disadvantaged. Brown’s proposal closely matches methodology developed four years ago in a brief (definitely worth reading) co-authored by State Board President Michael Kirst with then law professor and now state Supreme Court Justice Goodwin Liu and former state Secretary of Education Alan Bersin. The primary difference is that their formula also factored in regional costs of living, while Brown, in an effort to make it simpler, does not. “We propose a new system that is more rational, more equitable, and, we believe, politically feasible,” the authors said in their introduction. Their method certainly is the former; it’s too early to say whether legislators, once they do district-by-district calculations, will adopt it. However, the intent, by phasing it in over five years, is to ensure that districts won’t get any less money than they receive now. The state would calculate the total unduplicated number of low-income students, English learners, and students who are are both (more than 80 percent of English learners are also poor) for each district. “Low income” would be defined as eligible for the federal free and reduced price lunch program – more than half of the state’s students. The formula adds a straight 37 percent of the base grant for districts in which the total number of disadvantaged students is under 50 percent. Example: A district with 20 percent disadvantaged students would receive 20% times 37% times $6,000, or $444 (7.4 percent) above the $6,000 base rate. For districts with 40 percent disadvantaged students, the amount would be $888. Districts where more than half of students are disadvantaged would get proportionally more money – an increase of 7.4 percentage points for every 10 percent above 50 percent. In districts with 60 percent disadvantaged, the premium increases 7.4 percentage ponts to 44.4 percent, resulting in $1,598 per student above the $6,000 base rate. At 80 percent concentration, the premium rises to 59.2 percent times .80 for an additional $2,842 per student. At 90 percent, it’s 66 percent times .90 for $3,596. Base funding is defined in the brief as covering the basic costs of education (“textbooks, safe and clean facilities and qualified teachers and other personnel”). However, K-12 funding has been cut substantially since 2008, when the brief was written. Nick Schweizer, the state Department of Finance’s budget manager for education, cautioned in an email that the base amount may have to be scaled back. The formula does not differentiate between elementary, unified districts, and higher-cost high school districts as the current system does. That will likely be one point of contention. For now, at least, per-student funding will be allocated to districts and not to school sites, as some advocates of weighted funding argue should be the case. School site funding has been tried in Oakland and is being piloted in Los Angeles Unified and Twin Rivers Unified under the project Strategic School Funding for Results. It ensures that extra funding gets to low-income schools. But districtwide, weighted student funding can be harder to administer and can put the squeeze on schools with high concentrations of higher paid, veteran teachers. Along with special education, the only categoricals that will be excluded from the formula will be federally funded school nutrition; after-school programs, because voters would have to change funding for them under Propostion 49; preschool funding; and money for the Quality Education Investment Act (QEIA), because it stems from a legal settlement with the California Teachers Assn. Districts would have complete flexibility over how the extra money for poor kids and English learners would be spent. They could create financial incentives to attract the best teachers to come to low-performing schools, hire aides, lower class sizes, extend the school day, or focus on staff training. Or they could splurge on football uniforms or spread dollars evenly on needy and non-poor students. In the mid-’90s, with a spurt in state revenues, Republican Gov. Pete Wilson created the class-size reduction program as a new categorical to prevent the extra money from ending up as pay raises for teachers and administrators. Kirst-Bersin-Liu argue that preceded the adoption of state curriculum standards and assessments. If districts are going to be held accountable for results, then districts should have autonomy and flexibility to determine how best to achieve them. Brown calls for the adoption of new, unspecified local accountability measures that would give parents and community members more access to information. The assumption is that they would become a countervailing force to ensure that money is spent wisely. Advocates for low-income students and English learners will nonetheless argue that there needs to be more assurance – and tighter rules – to ensure that money for disadvantaged students actually will be spent on them. The FRPL and EL counts are unduplicated, so that a district with 20% FRPL only, 10% EL only, and 5% both FRPL and EL would have a % FRPL or EL = 35% (the 5% both FRPL and EL would not be counted twice in the formula). • So, with BG = $6k and a district with % FRPL or EL = 40%, the formula would provide: 6,000 + 6,000 * 0.37 * 0.4 = $6,888 per pupil. 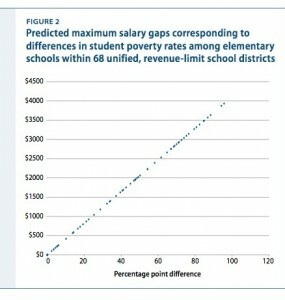 • For a district with % FRPL or EL = 60%, the formula would provide: 6,000 + 6,000 * 2 * 0.37 * 0.6 * 0.6 = $7,598 per pupil. • For a district with % FRPL or EL = 80%, the formula would provide: 6,000 + 6,000 * 2 * 0.37 * 0.8 * 0.8 = $8,842 per pupil. • BG + BG * 0.37 * % FRPL or EL + BG * 2 * 0.37 * % FRPL or EL * the % FRPL or EL above 50% (or, said another way, % FRPL or EL – 0.5) or 0 if the % FRPL or EL is < 50%. • For a district with % FRPL or EL = 40%, this representation of the formula would provide: 6,000 + 6,000 * 0.37 * 0.4 + 6,000 * 2 * 0.37 * 0.4 * 0 = $6,888 per pupil. • For a district with % FRPL or EL = 60%, the formula would provide: 6,000 + 6,000 * 0.37 * 0.6 + 6,000 * 2 * 0.37 * 0.6 * (0.6 – 0.5) = $7,598 per pupil. A more narrative description of the formula: It adds an amount equal to 37% of the base grant for each FRPL or EL student until you reach the 50% threshold. Then an additional 7.4% of the base grant is added per FRPL or EL student, on top of the 37% already added on, for each 10% increment above the 50% threshold. So, at 60%, 7.4% of the base grant is added, which grows to 14.8% of the base grant at 70%, and 22.2% at 80%, and so on. 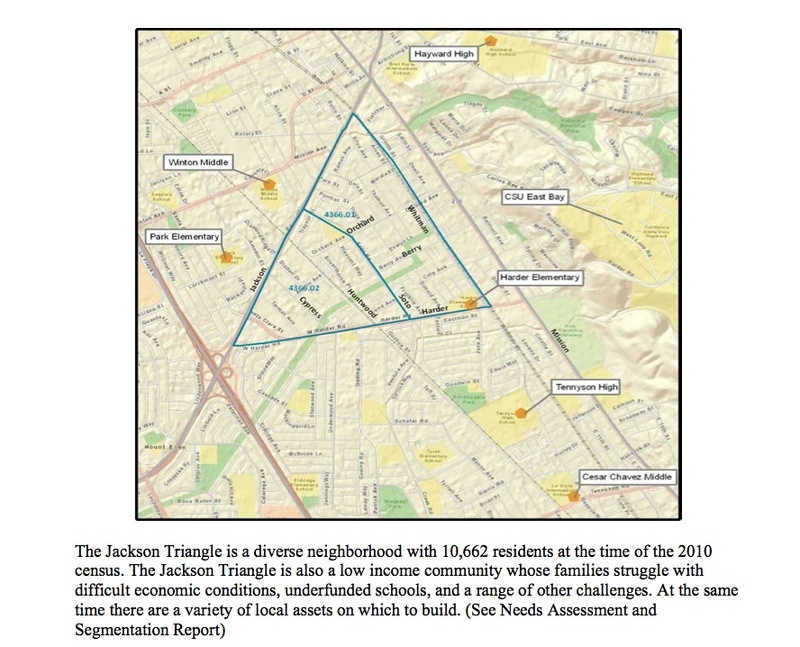 The Jackson Triangle in the Bay Area city of Hayward is one of five recipients of a federal Promise Neighborhood grant to give students in the low-income area academic, lifestyle, and community support to succeed in school. California State University, East Bay is lead agency on the project, which will receive $25 million over the next five years. 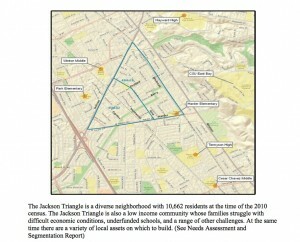 Map of the Jackson Triangle Promise Neighborhood (Source: Hayward Promise Neighborhood) Click to enlarge. Promise Neighborhoods are modeled after the Harlem Children’s Zone, a groundbreaking program that runs charter schools, offers afterschool and preschool programs, and provides free parenting classes, health care, counseling, and access to social services to thousands of children and adults to help break the cycle of poverty through education. 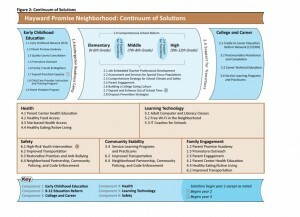 The Hayward Promise Neighborhood is a partnership of about a dozen schools and agencies, including the city, the Hayward Unified School District, Cal State East Bay, Chabot College, the local regional occupation program, the Child Care Coordinating Council of Alameda County, and the county public health department. Pathway from cradle-to-career in Jackson Triangle. (Source: Hayward Promise Neighborhood). Click to enlarge. sure that students are ready for kindergarten and everything that follows. 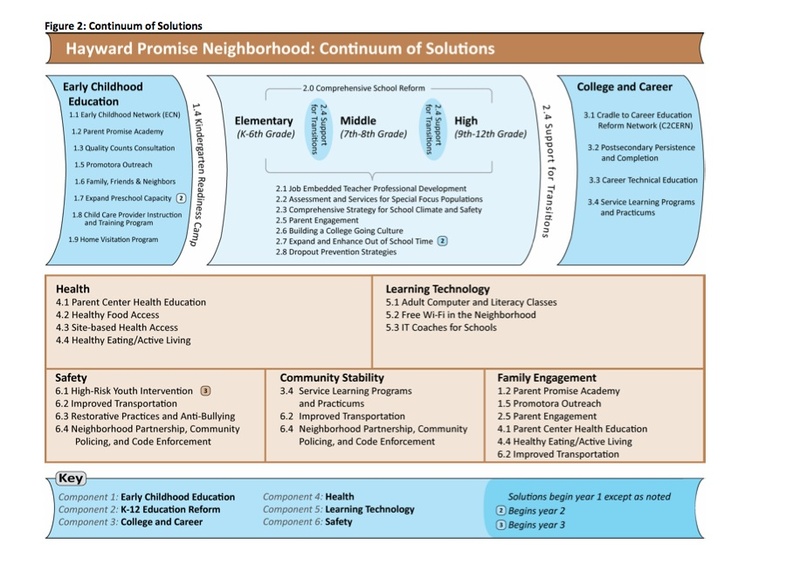 Many of the strategies to improve the schools and student achievement were developed last year through a $500,000 planning grant that the Hayward group received from the federal government, and are laid out in a 21-page plan. Although the Harlem Children’s Zone inspired the Obama Administration to launch the program, the Hayward plan differs in one significant way: it doesn’t include charter schools. With charter schools, not everyone gets to participate, said Cal State’s Nelson, but the Jackson Triangle is inclusive. Being proven right is usually a cause for some self-satisfaction, but U.S. Education Secretary Arne Duncan was troubled Wednesday when he announced results of a new Department of Education study on Title I and other high-poverty schools. Unequal spending on salaries in Title I schools. (Source: U.S. Dept. of Education). Click to enlarge. By “many” Duncan means a lot. 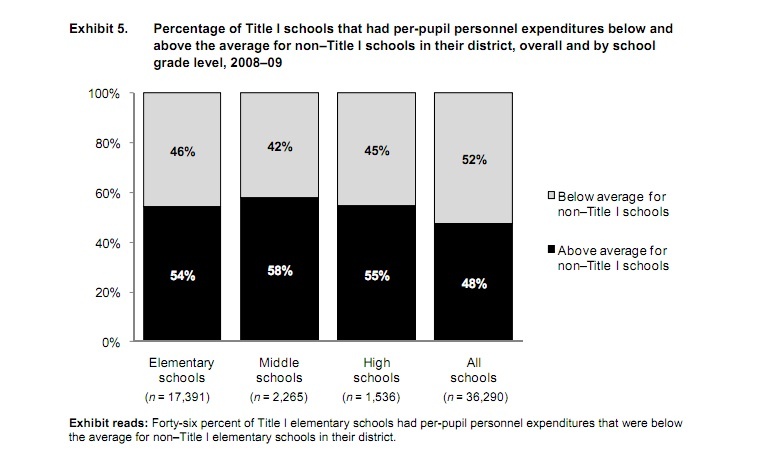 More than 40 percent of Title I schools spent less per student on salaries than non-Title I schools within the same district, according to the first-of-its-kind study. U.S. Department of Education researchers examined teacher salaries and spending on other resources for more than 13,000 school districts across the country. Schools had to submit the information as a requirement for receiving funds under the 2009 American Recovery and Reinvestment Act (ARRA). Of California’s 10,000 or so schools, well over 6,000 receive funds from the federal Title I program to provide additional support for children considered at risk due to poverty. The Department of Education’s report came one day after the U.S. Census Bureau released new figures showing that more than one in five U.S. children live in poverty, an increase of over a million children between 2009 and 2010. Under the Elementary and Secondary Education Act of 1965 (ESEA is the previous and soon to be subsequent name of No Child Left Behind), schools eligible for Title I funding first have to receive state and local funding that’s comparable to the amount given to non-Title I schools. Since about 80 percent of funding goes to salaries, it should be simple to calculate. However, the definition of comparability was compromised by a loophole in Title I language that allows reporting by district-wide salary averages rather than by individual schools. (B) Determinations – For the purpose of this subsection, in the determination of expenditures per pupil from State and local funds, or instructional salaries per pupil from State and local funds, staff salary differentials for years of employment shall not be included in such determinations. The loophole makes it nearly impossible for the U.S. Department of Education to know whether districts are giving Title I schools at least an equal amount of state and local funds as the rest of the schools in the district. “In far too many places Title I money is filling budget gaps rather than being used to close achievement gaps,” said Duncan. That would change if the reauthorization of ESEA authored by U.S. Senators Tom Harkin (D-Iowa) and Mike Enzi (R-Wyoming) makes it through Congress. They’ve inserted language to close the loophole. In its usual ambivalent fashion, California is a bit ahead of the rest of the nation in requiring better reporting, but is not doing so well in ensuring that the data is accurate and uniform. In 2005, California passed SB 687, the first law in the country requiring every district to report per-pupil spending annually – including teacher salaries – on a school-by-school basis. The bill, by State Senator Joe Simitian (D-Palo Alto), amended the School Accountability Report Card, or SARC: detailed reports containing demographics and other information that every school must complete and make public. One problem with SARC, said attorney John Affeldt with Public Advocates, is that the State Department of Education has not provided clear guidance on the reporting categories. In a report he co-authored on SB 687, titled “Lifting the Fog of Averages,” one example, said Affeldt, is that while some districts include librarians in the same group as teachers, others put librarians in a different pot. And when counting people who work at more than one school, such as custodians and resource specialists, some districts will divvy up the salary among all the schools, while others make it a district expenditure. 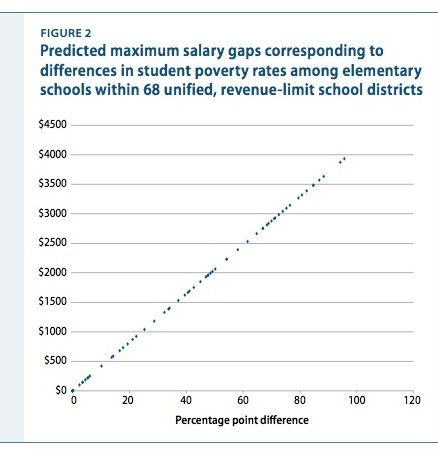 Salary gaps can reach nearly $4,000 in districts with large ranges in poverty levels. (Source: Center for American Progress). Click to enlarge. teachers, i.e., the least experienced, to work in the highest-poverty schools. California Assemblywoman Julia Brownley (D-Santa Monica) is attempting to take SB 687 a step or two further. Her bill, AB 18, would create a weighted student funding formula that would give schools more money for each low-income child enrolled. AB 18 is on a two-year track, and should be taken up in the next legislative session. But Duncan insists that states and districts don’t need to rewrite their funding formulas to abide by the intent of Title I. Most districts would have to change only 1 to 4 percent of their total school-level expenditures in order to provide comparable funding for their Title I and high-poverty schools, said Duncan. But that small shift could be huge for Title I schools, bringing an increase in funding of between 4 and 15 percent. The U.S. Department of Education has put a searchable database on line for educators, parents, policymakers and anyone in the public to see how their local districts stack up in funding high-poverty schools. From there, Duncan said he hopes to get a national conversation going. Only Congress can change the actual law, said Duncan, but that doesn’t mean that school districts can’t start doing the right thing. 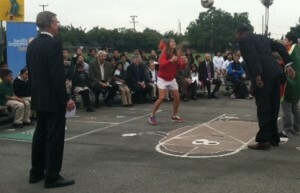 With monster 49ers tackle Bill “Bubba” Paris heading a soccer ball to Brandi Chastain (her idea) and Superintendent of Public Instruction Tom Torlakson leading elementary school students in San Jose on a lap around the field while still in a suit, Torlakson on Thursday kicked off Team California for Healthy Kids, an initiative to spread the gospel of healthy eating and exercise. It’s not a new message, of course, but, faced with rising childhood obesity and asthma, cannot be said often enough. Between one-third and a half of minority children born this year will become afflicted with diabetes – an astonishing figure cited by Dr. Harold Goldstein, executive director of the California Center for Public Health Advocacy. Brandi Chastain receives a header from "Bubba" Paris; they're part of Tom Torlakson's Team California for Healthy Kids. The California Center and other health advocates have succeeded in working with the Legislature to pass laws driving soft drinks and candy out of schools; it’s been a harder struggle, in part for lack of leadership and creativity, to bring good food into the schools. A fresh food ethic is spreading, however, and reaching districts like Alum Rock Union Elementary School District, a low-income, predominately minority district in East San Jose, which Torlakson chose as his launching pad. At Ryan Elementary, kids have an open salad bar every day; through a federal grant, fresh fruit and vegetables from local growers arrive three times each week for distribution as snacks during breaks and recess; water is becoming the drink of choice; and students late for school no longer go hungry (serving breakfast in bags in the classroom has increased participation from 20 percent to 80 percent, according to Amber Watson, director of Alum Rock’s child nutrition services). Companies like organic lunch provider Revolution Foods of Emeryville are finding they can make a business of lunch in public schools. Team California has a website for passing along ideas and tips for physical activities like instant recess, quick exercises within a classroom. And Torlakson is hoping to inspire partnerships for after-school programs, collaborations with farmers markets and community gardens. 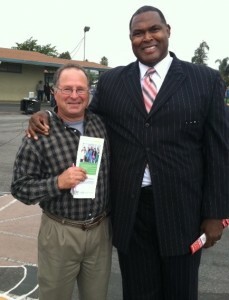 Certainly, if Torlakson could repeat the assemblage of star athletes that he brought together in San Jose – Paris, Chastain, pitchers Vida Blue and Bill Laskey, super marathon runner Dean Karnazes – in all 10,000 schools in California, kids would be inspired to change. Short of that – or without leadership at a district or community level – it will be a struggle to win over one student, one family, one school at a time. Chastain, former Olympian and women’s professional soccer player, encouraged Ryan students to choose what’s best for them, regardless of what other kids are eating or doing with their time: “You are the leader of you; make choices that others aren’t making,” she said. “I thought that was normal; the love I found in my meals would live on” into adulthood. Rich foods with the worst ingredients were what he associated with family, comfort, happiness. After he retired from football, his weight mushroomed to 400; he had high blood pressure and developed diabetes. He faced the odds of a short life. He switched what he ate, lost 75 pounds (he’s still 325) and brought his diabetes and cholesterol under control. “I know how you can change things if you want,” he said, but more important is to start with a healthy lifestyle in elementary school. Offering them alluring TV programs and computer games? The answer is in, Goldstein said, with more than a third of children obese and overweight, with children today facing a shorter life expectancy than their parents. neighborhood as if spoken by her curly-haired toddler. “Daddy doesn’t like us to take our shoes off,” narrates Klinker as the boys play in the sand and on climbing structures at the park. “He said there are things in the park that little kids shouldn’t touch,” she continues as the camera focuses first on a hole in the ground that has sharp sticks in it, then on two small rectangular packages that look like they may hold syringes. Klinker and seven other young journalists showed their films this week at a forum sponsored by New America Media, called “Growing up poor in the Bay Area.” They are intimate stories of poverty that shared a theme – sometimes spoken, sometimes not – of the inextricable connection between poverty and all aspects of a child’s life: health, civic participation, education. Shawn Savers’ Roseanna chronicles his sister, forced to leave college and live out of her storage unit after she and her mother became homeless. Justin Lai, who attends San Francisco’s Lowell High School for the city’s academically gifted students, profiled an Asian American classmate who has decided not to attend college, an unthinkable choice even for a low-income Asian American, and one who attends Lowell, no less. By sheer coincidence the forum was held September 14th, a day after the U.S. Census Bureau released sobering statistics on rising levels of poverty in the United States. 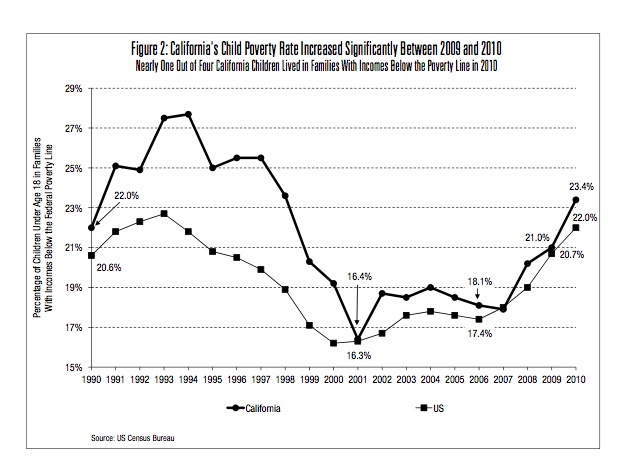 California child poverty rates from 1989 to 2010. (California Budget Project) Click to enlarge. The federal poverty line is an income of $22,000 a year or less for a family of four. It doesn’t matter if you live in the most expensive city in the country or the poorest. Six million Californians, over a third of them children, fall into that category. Their numbers have been rising steadily for the past four years. The threshold is higher for free or reduced price school lunches in California: 185% of the poverty level, or about $45,000 a year. Nearly half the state’s students qualify. 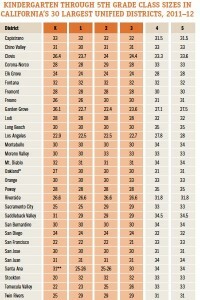 The number of students who qualify is much higher in some regions; two-thirds of the students in San Bernardino and three-quarters in Merced. Living in poverty, even for a short time, can have a profound and long-lasting impact on a child, said Andy Krackov, with the Lucile Packard Foundation for Children’s Health, who presented the latest statewide figures on family income and childhood poverty. The Foundation runs a program called kidsdata.org, which gathers and analyzes data on more than fifty topics including school safety, bullying, and reading ability. Third grade reading by socio-economic status (kidsdata.org) Click to enlarge. disadvantaged children scored proficient or higher on the state’s English/Language Arts standardized test. Students in higher income families did more than twice as well. But it’s not clear why this is the case or what to do about it, said Krackov. Part of the problem is there’s not enough data and part is not enough time to make sense of it. Sandy Close, the founder and executive editor of New American Media, doesn’t think much will change unless more stories, like those produced by the young filmmakers, get told. She says the media hasn’t covered poverty as a policy story, perhaps because it crosses so many boundaries and doesn’t fall neatly into one category, or maybe because we don’t necessarily have the right words to describe it. Somehow, she says, we have to both confront the statistics of rising youth poverty and go beyond the numbers to get the public to care. 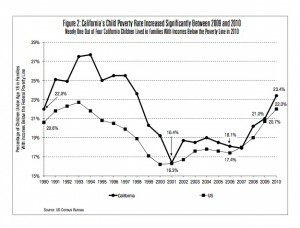 With an increase of 2 percentage points in one year, one in five children lives in poverty in California. That’s the highest proportion in a decade and is equal to the national average, according to Kids Count, an extensive report on the state of children in America by the Annie E. Casey Foundation. In California, 29 percent of African-American and 28 percent of Hispanic children live in poverty. The latest state data, mostly for 2009, shows increasing numbers of families living on the edge, with 7 percent of families experiencing the disruption of a mortgage foreclosure, compared with 4 percent nationwide, and 34 percent of children living in families where no parent has a year-round full-time employment (51 percent of African-American children). 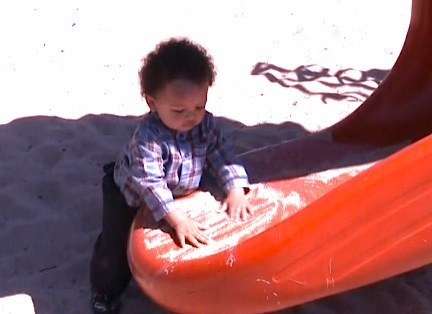 Despite the economic turmoil, California also improved on several of the 26 measures of child welfare, so that California’s ranking improved to 16th among the states, up from 19th in 2010. There were fewer teen birth, teen deaths and a big drop – down nearly 30,000 to 113, 000 – in the number of teens ages 16-19 not in school. The latest data don’t include the impact of the last two years of state budget cuts to health care, education and child care, which will leave more kids vulnerable. 24 percent of female-headed households receive child support, compared with 28 percent in 2004. The report includes breakdowns by county for most of the indexes.